A naughty fairy you ask? Let me explain. Back in 2017 I created the “Christmas” and “Snow” Angels with the promise of an update. 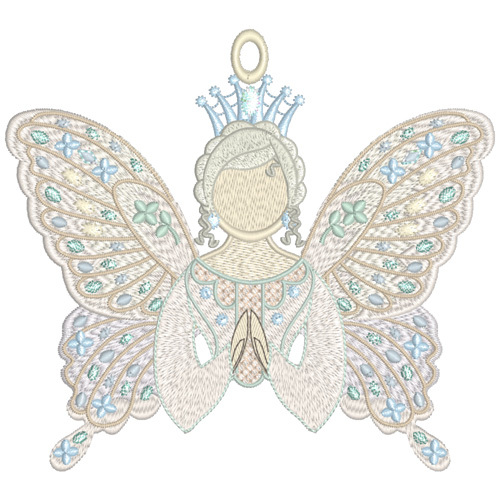 Well in digitising and finishing off the update, a new angel with fairy wings I discovered she is inclined to misbehave in the hoop! To be sure that she gets a warm welcome in many homes this Christmas I have spent considerable time perfecting her….. I confess that I had a lot of problems with the proposed edging of the wings, shown in the image below, as they went out of alignment all too easily especially the tiny hoop at the very bottom of the lower wings. 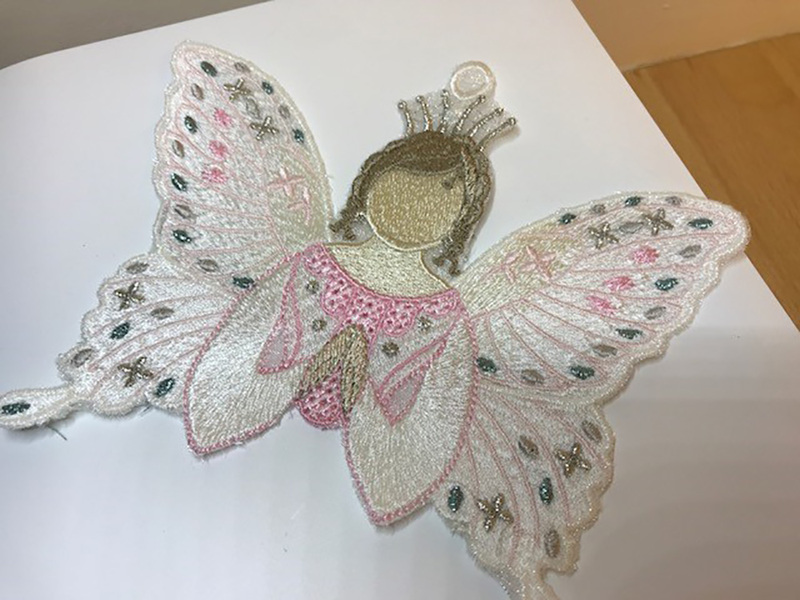 When I stitched the upper section of the fairy on polyester organza and Sulky soft and sheer, in a 240 mm x 150 mm hoop, I did not get very good results at all and the design was a little better using my 200 mm x 200 mm hoop. Square hoops always give the very best results as the fabric is held equally on each side, but I was still not happy with this “naughty” fairy. Obviously when digitising designs I am always aiming to make them as simple as possible to stitch out, and try to eliminate any problems such as misalignment. I experimented with spray starch and also Lavender Mary Ellen’s Best Press, which just gives a little more substance to the fabric and stabiliser, hoping it would prevent the misalignment of the edges of the wings but not so. In the end I decided that if it difficult for me to get good results it was obviously not foolproof, so I took away the edges and made the necessary alterations to the fairy designs. While I was changing the wings I added a little more decoration too. I hope you like the new fairy. Obviously not all the elements within the designs need be embroidered and can be edited out if a simpler look is preferred. You may also want to substitute them for hot fix pearls and crystals, or sequins and beads. Safe to say that the fairy has given up her naughtiness and is behaving perfectly both in and out of the hoop now. 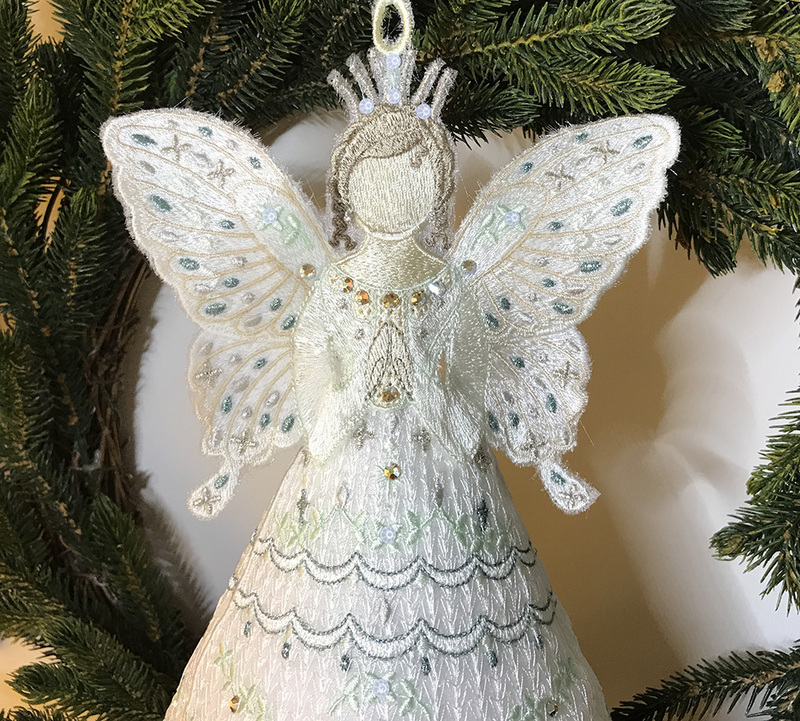 This beautiful Fairy is embroidered using some metallic threads to make her sparkle in the Christmas lights, and when finished she should be given extra bling. Here hair is stitched out in Madeira Lana Silver grey 3686 but you can substitute this for an ordinary thread. The wings can be stitched out in two parts if preferred. 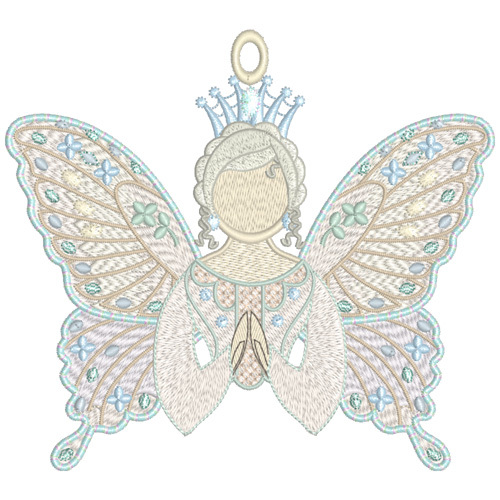 I have chosen icy blue, green colour way but I know that many little girls, including my grand daughters will prefer a “pink” fairy like this one shown here. Use more metallic threads or scale down the amount of colours used to give a different look. How about a white fairy with just silver details? I found that Sulky metallic 30wt thread stitched out perfectly on my Husqvarna Epic machine with a top stitch needle, and I didn’t even have to slow it down! If the detail on the hands is not noticeable enough for you may I suggest you just stitch that colour over again. Sometimes this is a good idea with outlines especially facial features and small text. 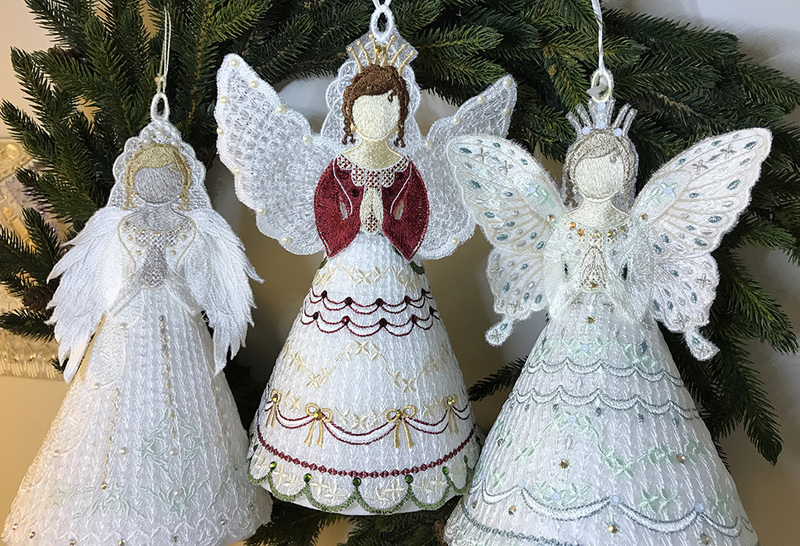 So here are the three angels finished and embellished with pearl and crystals. Here are some ideas on how to use these designs. 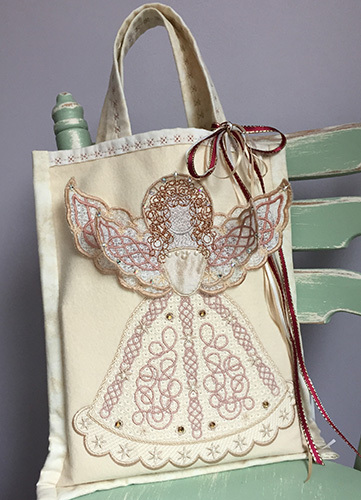 Make the wings and apply them in place with the skirt and body for a gorgeous bag to give this Christmas. This was a bag that I made with the Celtic Angel, embroidering on felt which is an absolute pleasure to work with. Use the smaller designs in the collection to decorate your Christmas tree, a Christmas wreath, some Christmas bunting or napkin rings. The possibilities are endless and I invite you to share your photos of what you create with this set of angels as each one is always unique to its creator. 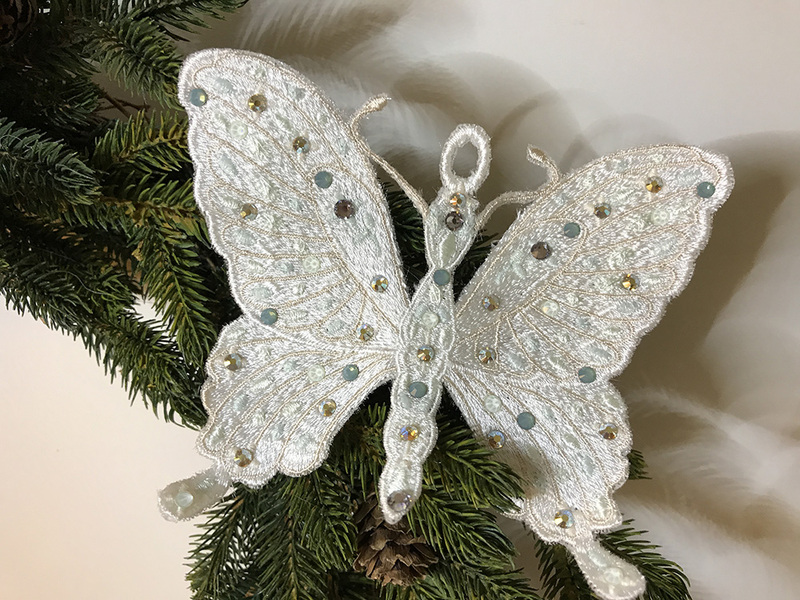 While working on the fairy it seemed appropriate that I make a butterfly with the wings for those who like to hang something different on their tree at Christmas. All my test outs were done on polyester organza and I used Sulky Soft and Sheer as my stabiliser. When each design was finished I trimmed carefully around it leaving just a tiny edge of polyester which is my preferred method. 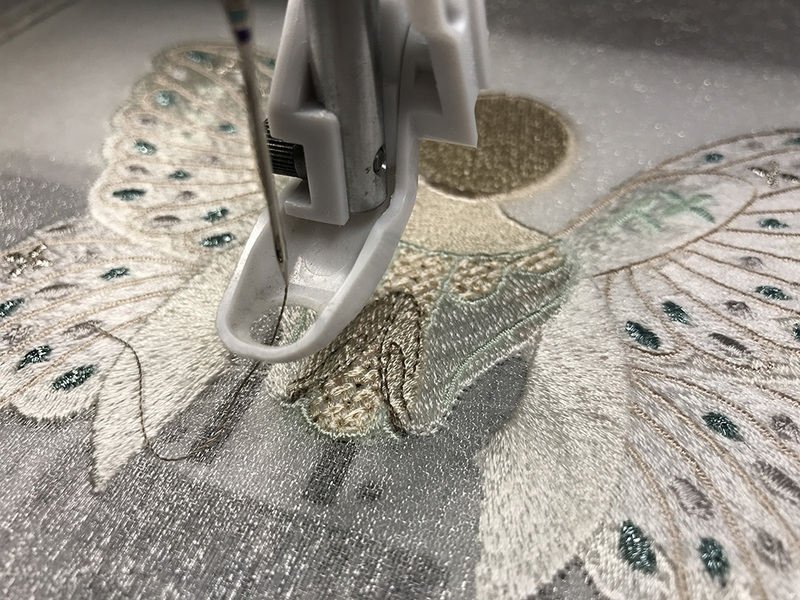 I use my Kai curved embroidery scissors to do this, as the curves cut around the design perfectly and it is essential to turn the scissors over to match the curve you are trimming. If I always cut into the corners it helps too, and of course I use my Daylight magnifying light so I can see exactly what I am doing. 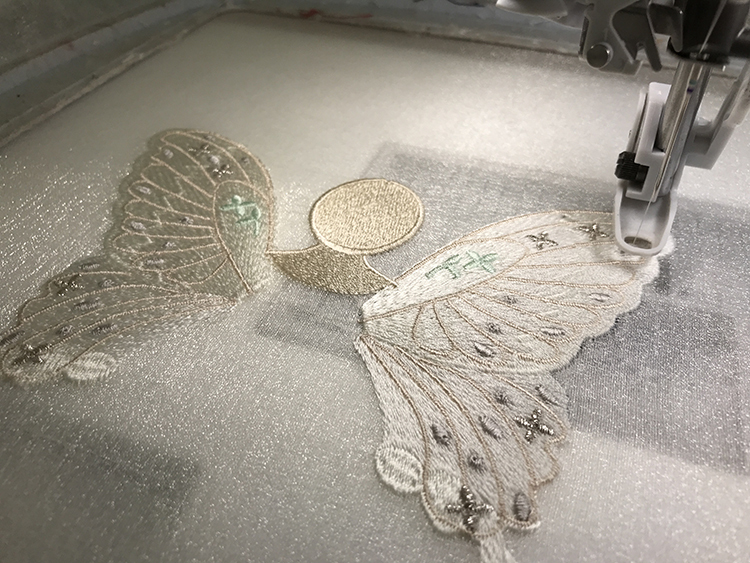 A magic heat cutting tool will also trim designs perfectly but remember it will only work on polyester and the stabiliser would need to be washed away first. The standing versions of the angels are held together with a boned support and a Vellum underlay. These are some of the angels I have made for my own Christmas decorations. 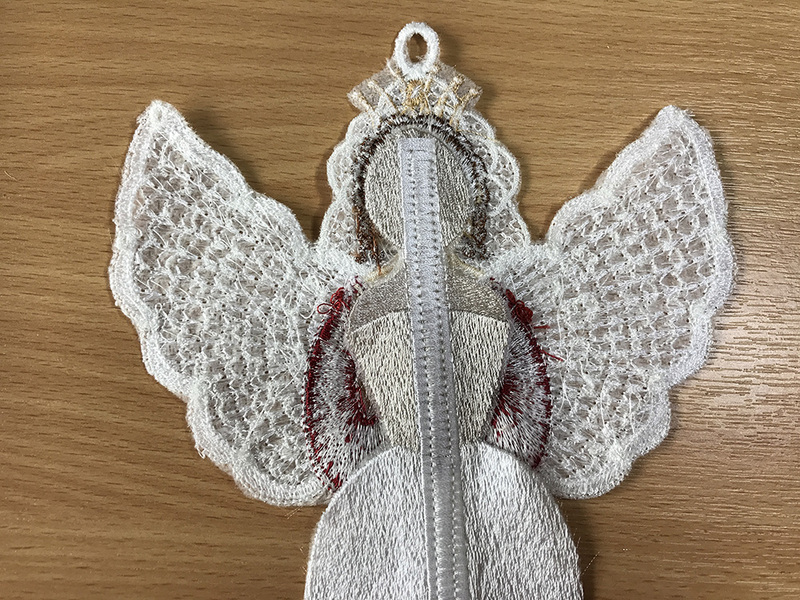 Check out all my angels which are in the sale at the moment until October 8th, 2018, which gives you plenty of time to create some spectacular embroidery for Christmas this year. 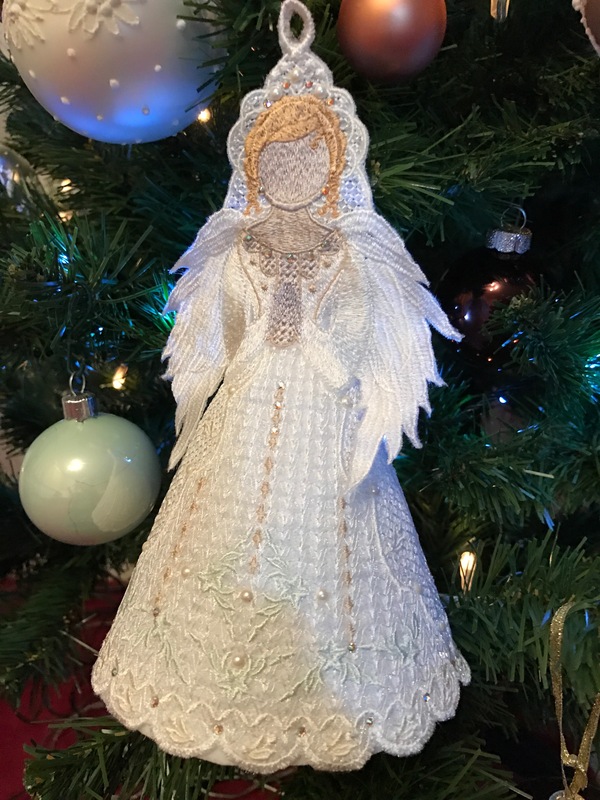 This entry was posted in Embroidery projects and tagged 3 Dimensional embroidery, Christmas, Crystals, machine embroidery. Bookmark the permalink. Wow Hazel!!! All the angels are beautiful! I have your angels and hope to make time to make all 3 ! I love the detail on them . 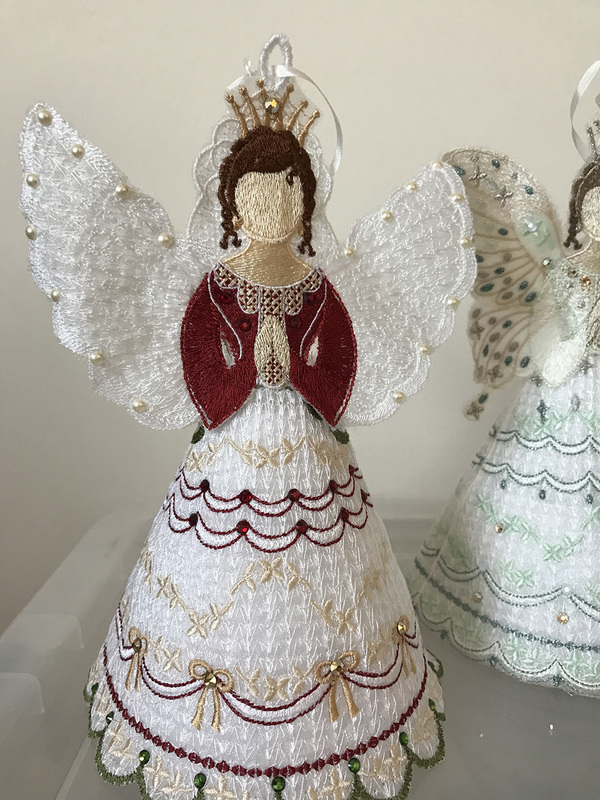 I also love the change of thread colors like the maroon or burgundy botice and trim on one of your angels. I can see them decorating my home this year! Thank ya u for you ur creativity! I think your wonderful!